I had met Richard a few times on this particular stretch of the Bristol Avon and we talked about fishing, and found out he was just getting back into angling again after working overseas for quite a while. We decided to fish together at a later date and this date duely arrived. We met at 7am with the sky clear and very blue. It was due to be very hot with some cloud coming over later in the day. The swim I wanted us to fish was a fair walk away (they normally are) and we were soon looking at a small swim with a few chub. However on the far bank there were several area’s of bankside grasses that covered the gravel area. After feeding a few pellets some more of the swims inhabitants showed themselves. There were more chub to about 5lbs and a few barbel up to about 7-8lbs. The plan was to lure the barbel upstream to a more accessible swim so that we could land any which were caught. We fed just pellets and soon the chub were really feeding hard. The barbel were reluctant to come out from their cover, but this didn’t matter as the chub would be a good quarry. The rigs are braided hook link set 8inches from the lead which has a back lead keeping everything nailed to the river bed. The bait was a 12mm pellet connected via a hair on the hook. 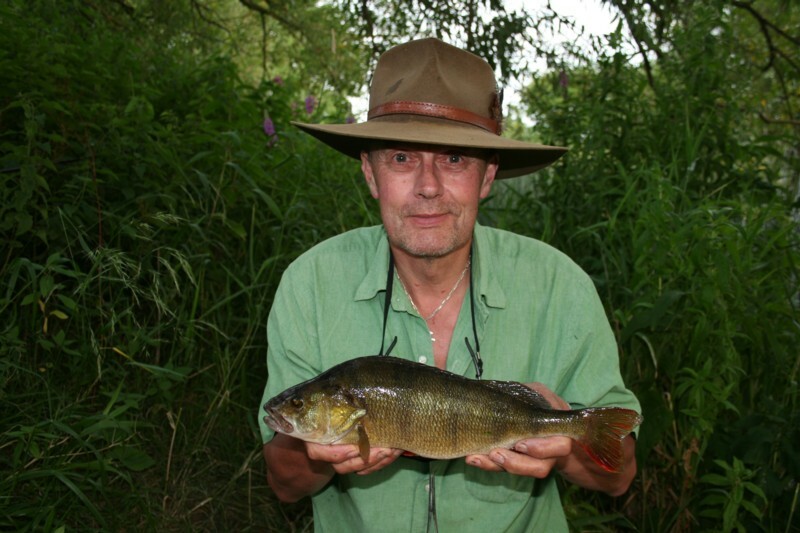 This rig is good with barbel and chub. Richard enthuses about his centrepin reel, and he wanted to use this. His first cast was spot on and we waited for the take, the rod nodded a couple of times and Richard struck and the lead whistled past our ears. The chub were not too spooked as we cast out again, and soon another chub picked up his bait and we had a repeat performance. The next cast saw a chub of about 5lbs pick up the bait, it twisted and turned buy couldn’t shake the hook out, this time Richard played the thing for a sort while before it shook the hook as it got amongst the pipe reeds. We had a couple of other casts after we rested the swim however they were still spooked a little. We agreed it was time to move on to the next swim. Here we put out some pellets and waited to see what happened. I also baited another swim about 100 yds downstream. Again we didn’t need to wait too long before a double figure barbel drifted into the swim. It did feed with it’s tail waving at us at times. It even had the cheek to feed off the top of the boulder, the one which just touched my line last week where I lost a good fish. There were two of them feeding eventually. However after we waited for an hour or so after they left the swim we decided to call it time on this swim. We could have waited however Richard was keen to move on. We moved to a couple of other swims at the other end of the fishery, where yet again we found barbel and chub. In one swim there was a possible double figure barbel plus a few others, and in another was about 6 between 1-7lbs. We chose to fish this swim first however we spent a very frustrating hour there with the chub and barbel ignoring the pellets. So we tried the swim with the larger barbel with the same result. It was now moving into the late afternoon so we decided to walk back up to the original swim with the chub and barbel. It is one of the longest walks on the fishery and we were disappointed to find someone fishing there. Walking along the bank we met Kevin who I have met numerous times. He has had some good fish this season so far on several different rivers. The trouble is once you get Richard and Kevin together they just gas and gas on about centrepin reels. In fact they go on and on and on, I need to yawn a few times just to make sure I’m still alive, however each to their own I suppose. So Richard and I ended up in the swim where we saw a couple of big barbel. They did come back and feed a few times but nothing took the bait. We even fished the other swim further downstream where we had seen 3 barbel feeding. It seemed though that we could find them but once you cast in they would disappear. Kevin was finding the same today. 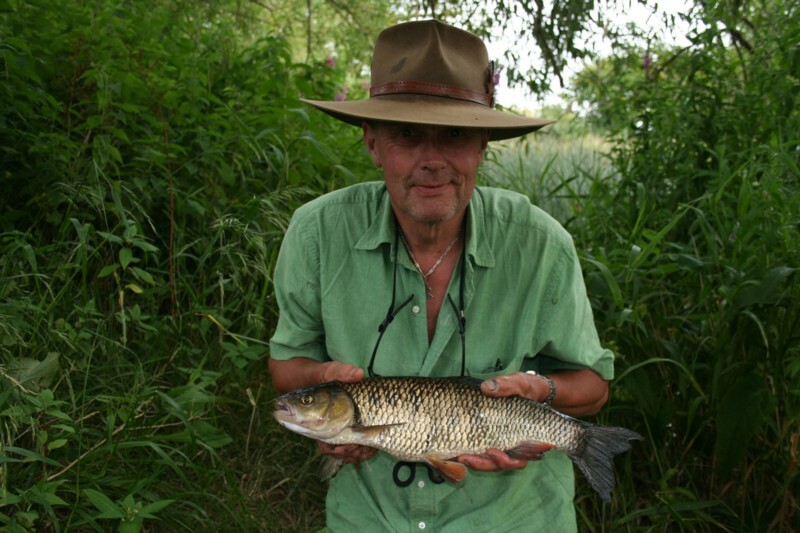 Final casts were made into another swim we fished where we saw several barbel and chub. It was now 6pm and the sun had disappeared behind some clouds and the fish were now picking up the bait. Soon Richard had a pickup from a nice small chub of 3lbs 12oz so at least it wasn’t going to be a blank. So a quick photo and we were looking back into the swim. The barbel were pretty much tucked up under cover on the far bank. The chub though were still picking up the pellets. Several times you could see them pick up Richards pellet and spit it out without any movement on the rod top. While we were looking at the chub and barbel a perch of a couple of pounds kept swimming past. Eventually I had enough and decided to fish for it with a free lined lob worm. No sooner had I put the lob on the hook when Richard said I’ve hooked that bloody great perch, on pellet too. Soon it was in the net and weighed. With the photo completed I didn’t want to waste the lob worm so I cast out in a swim slightly upstream. The chub present in the swim investigated the lob on a couple of occasions and then the line twitched a couple of times and a short fat little chub of about 1.5lbs lay in the bottom of the net in no time at all. This entry was posted on Friday, July 29th, 2011 at 4:15 pm	and is filed under Uncategorized. You can follow any responses to this entry through the RSS 2.0 feed. Both comments and pings are currently closed.